About this Virtual Run: Make some noise for children’s cancer research by participating in the Make Some Noise virtual 5k/10k/Half Marathon. This virtual race can be completed anytime and anywhere, even indoors on a treadmill. 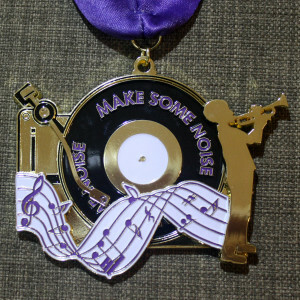 All registrants will receive a custom, electronic race bib and this awesome 4″ record player medal. The record’s arm moves and the record spins! Race bibs are generated instantly and medals will be shipped to participants after they upload their results or at the end of the virtual race period, whichever comes first. About the Charity: The Make Some Noise: Cure Kids Cancer Foundation was established by a child with cancer with one purpose in mind: to fund pediatric cancer research. To that end, the foundation serves as a vehicle to secure private funding to distribute to research facilities and promote awareness through its fund raising activities. The designation of funds to various research facilities is cancer specific and based on the foundation’s annual evaluation of the latest research.